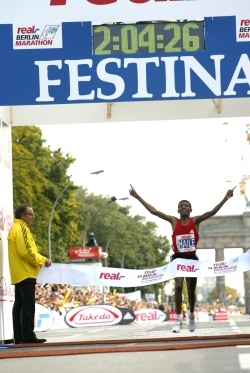 On the last day of September 2007, Haile Gebrselassie set a world record of 2:04:26 at the Berlin Marathon. The 34-year-old Ethiopian improved the old mark of his Kenyan rival Paul Tergat, who had run 2:04:55 in Berlin in 2003, by 29 seconds. If his race as a 15-year-old in Addis Ababa is taken into account, this was Gebrselassie’s eighth marathon. 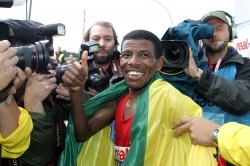 Take The Magic Step® spoke with Gebrselassie soon after he broke his long-sought record. Right after you crossed the finish line, you spoke on the telephone with Paul Tergat, who had rung the race director Mark Milde. What did he say to you? You set your 24th world record in Berlin. Does this one mean more than the others? You have run marathons in Amsterdam, Fukuoka, London and Berlin. How do the courses in these cities compare? 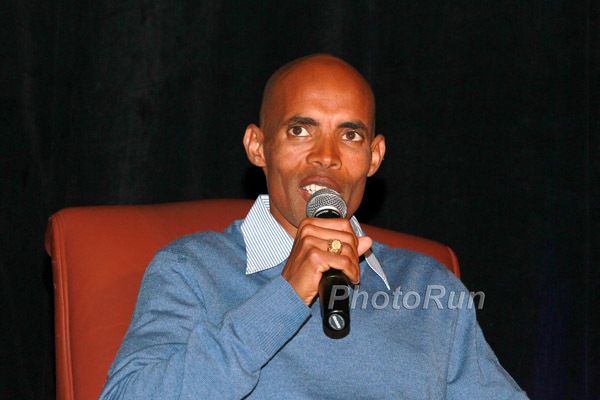 Haile: Most of these four races have very good, fast courses, but I think that only in Berlin are world records possible. Here everything comes together: the organization, the time of year, the weather, all the volunteers who ensure things run smoothly and, above all, the spectators. They definitely contribute 60 to 70 per cent of a performance. They push you to go to the limit. Berlin has, quite simply, the best spectators. All along the route they are cheering you on, and I could hear my name throughout the 42 kilometers. That was fantastic. 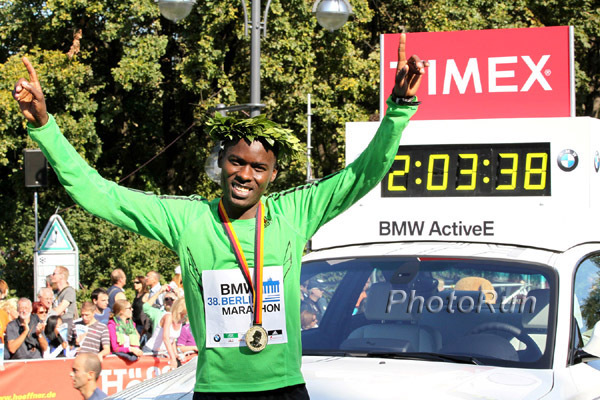 I think if the world record in the marathon is broken in the future, it will happen in Berlin. If you could change the Berlin course to make it faster still, where would you change it? How much faster can you run a marathon? Haile: I proved on Sunday that I can fast here. I was really aiming for a time of 2:03, but it hasn’t quite worked out yet. Last year I was a little annoyed, because I would have loved to have given the spectators a world record. I wanted to give something back to them for all their great support. But this year it came together. I think that in future a time of 2:03 in Berlin would be possible for me. Have you now found the right formula for the perfect marathon? Haile: Despite breaking the world record, I still can’t say that I have discovered the formula for running the perfect marathon. There are still lots of little things to worry about in the marathon. Every kilometer is different. Even if I never find the formula for the perfect marathon, perhaps in the future I could train a runner and pass on the experience I’m gathering now so that they could get closer to the solution. Forty-two kilometers is a very long way, and can hurt. Can you enjoy a run like that? Haile: If I win, I enjoy a race like that. I don’t have any pain in that case. You only have pain if you lose. I know full well that running is my job. Competition is a job that brings pain, but the job can also be wonderful—if you win. Will the two-hour barrier be broken in the marathon one day? Haile: Yes, certainly. Perhaps it will take 20 or 40 years before two hours is broken. But it will happen; I just don’t know when. Twenty years ago no one thought of achieving the times which are being run today, by both men and women. Haile: I will run my next marathon in Dubai in January. After the world record I want to fulfill my second marathon dream at the Olympic Games: Olympic gold over the classic distance. 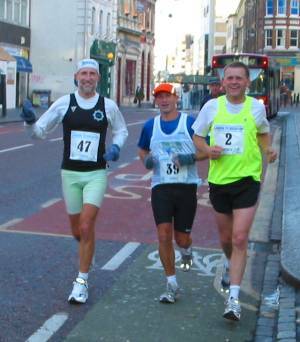 I would also like to return to the Berlin Marathon one day; I’ll have to see if Mark Milde invites me again. But I definitely intend to run the marathon at the World Championships in Berlin in 2009. You’ve lost your world record for the half marathon. Do you have ambitions about getting it back? Haile: Yes, of course, but as to when and where I’ll try for that, that’s my secret. I know, of course, about the fast course in the Berlin Half Marathon, but the race doesn’t fit so well into the schedule for 2008. It’s something I’ll have to work that out with my manager. Abebe Bikila, the Olympic marathon champion from Ethiopia in 1960 and 1964, decided at the age of 16 to run barefoot. Have you ever thought of doing that? Haile: I have huge respect for Abebe, and he took a decision at the time which was the best for him. I would never run without shoes, because shoes are what suit me. I can imagine that in those days shoes were very uncomfortable, and it probably just felt better to run barefoot. These days, however, the shoes are perfect. They are just what the feet need and for running. You have four children. Are they as interested in running as their father? Haile: No, not all of them. My 6-year-old daughter, Batiy, loves to run. Unfortunately, she hasn’t been blessed with as much talent as I was. She would love to become a runner later, but to do that she would have to live away from Addis Ababa, because in Addis there are too many distractions and not enough places to train. But you didn’t bring your family with you to Berlin? What does a normal day look like in the six-strong Gebrselassie household? Haile: I always get up just before 6:00. Then I go and run and return around 9:30. My house is in Addis Ababa, so first of all I have to drive to find somewhere quiet to run because the city is just too crowded. I would never get the chance to have a clear run. My wife, Alem, looks after our four children in the morning. The three oldest girls, Eden , Melat  and Batiy go to school, while our son, Nathan , has been going to kindergarten for the past year. When I come back from training, I shower, have breakfast and then go to the office. I have a real estate business in Addis Ababa. I usually have lunch with customers and business people there before I go back home in the afternoon. I then try to have a nap for one or two hours before going training again at 4:00. I usually do an easy run and then head for the weights room. The hours after that are the best. My children come back from school, and we spend the last few hours together before they go to bed. What’s an easy run for you? Can Haile Gebrselassie really run slowly? 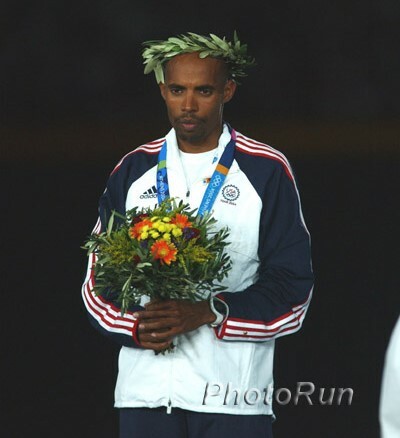 Haile: I really can’t just jog. Something in me forces me to run fast. An easy run for me is running 4:30 minutes per kilometer. I can’t do anything slower. Five minutes per kilometer would be just too slow.